* To the bath water one can add 1/4 cup (two tablespoons) of Magnesium Bath Flakes, 1 tablespoon or more of Magnesium Oil. Soak the whole body or just the feet in this bath water for 20-30 minutes, at a temperature of about 108 degrees. The most effective protocol for this therapy is to begin with a daily body or foot bath every day for the first 7 days, then continue with a maintenance program of 2-3 times a week for 6-8 weeks or longer. * Spray on skin, massage and leave. Used as a massage oil in physiotherapy and chiropractic applications. If irritation occurs when sprayed on the skin, dilute 50% with Prill Water. Alleviate joint pain & stiffness, treat psoriasis & resistant skin rashes, soften & smooth wrinkled skin, fade age spots & sun damaged skin. * For healing & maintaining oral health, apply to tooth brush, teeth, gums and under the tongue. Even discolouration of the teeth can fade. As a salt substitute, Magic Oil can be sprayed onto foods. Bath Flakes are based on Magnesium Chloride. Bath Crystals were formulated as advanced version of Magic Oil. When Magic Oil is taken further, it crystallizes. 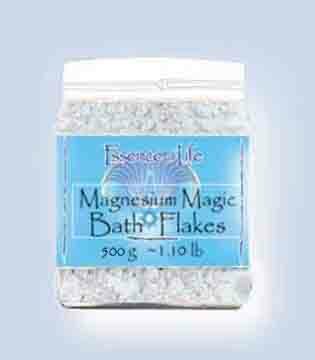 When you dry out the Magnesium Oil you will get Magnesium Bath Flakes. They are the solid form of the Magnesium Oil, full of Life Force, totally safe. It is not recommended to mix Magnesium Chloride and Epsom Salts. You may use dissolved Bath Flakes in a spray. Mix one cup of crystals in a cup of Prill Beads Water / Magic Water, and put it in a sprayer. Spray all over your body after your shower. An excellent means of absorbing critically needed magnesium and essential moisture for cellular regeneration. This liquid solution of magnesium chloride give immediate delivery and absorption into living cells. How healthy is Magnesium Chloride? Magnesium as well as chloride have some important functions in keeping the body in shape; young and healthy. Chloride is required for production of gastric acid each day and is also needed to stimulate starch-digesting enzymes. Magnesium rejuvenates and prevents the calcification of our organs and tissues that is characteristic of the old-age related degeneration of our body. Using other magnesium salts is less advantageous because these have to be converted into chlorides in the body anyway. We may use magnesium as oxide or carbonate but then we need to produce additional hydrochloric acid to absorb them. Many aging individuals, especially with chronic diseases who desperately need more magnesium cannot produce sufficient hydrochloric acid and then cannot absorb the oxide or carbonate. Table salt is sodium chloride, Epsom salt is magnesium sulphate - it is soluble but not well absorbed and acts mainly as a laxative. Chelated magnesium is well absorbed but much more expensive and lacks the beneficial contribution of the chloride ions. Chelated magnesium seem to lack the infection-fighting potential of the magnesium chloride ... as W. Last wrote in his excellent article. wrote J. I. Rodale in his book Magnesium, The Nutrient That Could Change Your Life. This is not a fantasy but the celebrated work of Dr. Pierre Delbet, called Politique Pr�ventif du Cancer. Dr Raul Vergini, in Italy says that epidemiological studies confirmed Delbet�s views and demonstrated that the regions with soil more rich in magnesium had less cancer incidence, and vice versa and says that in experimental studies the Magnesium Chloride solution was able to slow down the course of cancer in laboratory animals. Dr. Delbet demonstrated many years ago that Magnesium Chloride solution was a very good therapy for many diseases because it had an effect on the whole organism. He obtained very good results in: colitis, angiocholitis and cholecystitis in the digestive apparatus; Parkinson�s Disease, senile tremors and muscular cramps in the nervous system; acne, eczema, psoriasis, warts, itch of various origins and chilblains in the skin. There was a strengthening of hair and nails, a good effect on diseases typical of the aged (impotency, prostatic hypertrophy, cerebral and circulatory troubles) and on diseases of allergic origin (hay-fever, asthma, urticaria and anaphylactic reactions). who take it for its tonic action, several are afflicted with various ailments which disappear, and they report from time to time successes I did not expect." Actually one should be astounded and stand in awe when studying nature and a basic medicine like magnesium. Hippocrates said food is our medicine and when we look at magnesium we can see that this is no joke and that nutritionists can often equal or outdistance doctors in the practice of medicine. What we will read about magnesium is almost too good to be true for magnesium basically is good for anything that ails us. This is not a ridiculous statement when we look at how many crucial biological functions in which it participates in, the hundreds of enzyme reactions for which it is needed. The newspapers sing the praises of the wonder drugs that have devastating side effects but the action of this miracle mineral is swept neatly under the rug by the medical establishment that clearly favors pharmaceutically- formulated drugs from which fortunes can be made. anything about this magnesium therapy, so how can they give good advice? Children under 5, he says, nonetheless must consult their pediatrician." Magnesium chloride has a cytophilactic"
activity that no other magnesium salt has. It is not surprising that books have been written about magnesium and that in serious situations like autism, where the brain is flooded with mercury, that magnesium is effective in treatment, as Dr. Rimland has clearly indicated. Magnesium has even been seen to attenuate increased blood-brain barrier permeability during insulin-induced hypoglycemia in animal studies, which might explain yet one more reason why magnesium is essential in chelation and detoxification. If it can increase blood-brain barrier permeability during insulin-induced hypoglycemia it could possibly be a key to opening the gates for mercury to flow out of the cells. Magnesium protects brain tissue against the effects of cerebral ischemia, brain injury and stroke through its actions as a calcium antagonist and inhibitor of excitatory amino acids. This particular action might also explain why spirulina, which is high in magnesium, has also been shown in clinical studies to protect patients from strokes. Magnesium for diabetics is critical as it is for a whole host of people with various diseases. 1.64 mgs of Iron, 12.8 mg of Magnesium, 53 mcg of zinc. Spirulina has the ability to lock many minerals into amino acids. minerals in a form which our body can readily make use of. Bioavailability requires solubility, absorption, and eventual metabolism by the body. Bioavailability is a very important concept and gauges the extent to which an administered substance reaches its site of action or utilization in the body. Bioavailability is thus a measure of the efficiency of delivery - how much of what is ingested is actually used for its intended purpose. magnesium and DHEA levels than anything else we can imagine. our intracellular magnesium to a normal range." Dr. Shealy is referring here to transdermal application. In this chapter we are going to discover that magnesium, when used correctly, is the best weapon we have to defend the body, not only from infectious diseases of both viral and bacterial origin, but also from the chemical deluge of toxic chemicals that are invading our bodies everyday. Between its power to stimulate white blood cells and glutathione we have a heavy weight non toxic medicine we can use without a prescription. So basic and important is magnesium that we need to put it up on the same alter as Vitamin C though there are medical and pharmaceutical terrorists (CODEX) who would limit the amounts and dosages of crucial supplements even as our need for them goes dramatically up. Probably there has never been a greater form of terrorism conceived than that of deliberately denying the human race of the nutrition they need for health. not easy to assimilate and many take five years or longer to give results. It is estimated that 80% of the people in the world today are deficient in magnesium. The time scale of mineral uptake and loss is long, it can be many months or even years before exposure or lack of exposure to certain elements is noted with respect to a person’s state of health. Improving your mineral status by eating a whole food diet used to ensure that you get the right minerals in the correct, purpose-built proportions. But today supplementing is necessary because of increased chemical body burdens and the decreased mineral food values. Re-mineralization can improve the levels of long-term imbalances with truly life-changing results, and very quickly if administered in highly bio-available forms. Low mineral levels can cause, or at least, increase seizures. Mineral levels had a huge impact on the frequency of my son's seizures. His seemed most related to low magnesium levels, but others could also contribute. We found that we had to be very careful to re-mineralize after each round of chelation and he also benefited from longer breaks in between rounds. While he did have a few flare-ups of seizures during chelation, it actually helped reduce them greatly and now it is extremely rare for him to have a seizure. Magnesium rapidly distributes throughout the body following absorption. Normal plasma levels of magnesium range from about 1.6 to 2.1 nM. Magnesium supplementation is actually crucial for everyone today but we have to pay especial attention to the method of supplementation because this is critical in terms of effective body utilization. There are several foods that are very high in magnesium and adults can pick and choose foods to maximize magnesium consumption. But when treating children this is not always possible and often people resist dramatic dietary changes. Eating a wide variety of legumes, nuts, whole grains, and vegetables will help you meet your daily dietary need for magnesium. Selected food sources of magnesium are listed in the reference note section. [viii] Magnesium is absorbed primarily in the distal small intestines or colon. Active uptake is required involving various transport systems such as the vitamin D-sensitive transport system. Since magnesium is not passively absorbed it demonstrates saturable absorption resulting in variable bioavailability averaging 35-40% of administered dose even under the best conditions of intestinal health. These and other conditions make oral magnesium supplements intake chancy and inefficient compared to transdermal intake. Transdermal application of magnesium is far superior to oral supplements and is in reality the only practical way magnesium can be used as a medicine besides by direct injection. Though nothing can substitute for magnesium absorbed through foods high in magnesium medically speaking it avails us to supplement. The health status of the digestive system and the kidneys significantly influence magnesium status. Magnesium is absorbed in the intestines and then transported through the blood to cells and tissues. Approximately one-third to one-half of dietary magnesium is absorbed into the body. Gastrointestinal disorders that impair absorption such as Crohn's disease can limit the body's ability to absorb magnesium. We cannot benefit from minerals unless we can absorb them. The absorption of minerals primarily takes place within the small intestines. As food matter passes through the intestines, minerals transfer into the blood stream through the walls of the intestines. This can only happen if the minerals are ionically charged. cases admitted and treated with routine anticoagulants, 60 died. In no illness is DHEA/magnesium deficiency more prevalent than myocardial infarction (acute heart attack). On average, heart attack patients immediately given magnesium intravenously have a 50% greater survival rate. For conditions such as acute heart attacks, magnesium given by either an intramuscular injection or as an intravenous drip, is the preferred method of treatment. In spite of its low cost or perhaps as a result of its low cost, it is not given routinely to heart attack victims and this is sad. The Myers' cocktail, which was used effectively for acute asthma attacks, migraines, fatigue (including chronic fatigue syndrome), fibromyalgia, acute muscle spasm, upper respiratory tract infections, chronic sinusitis, seasonal allergic rhinitis, cardiovascular disease, and other disorders consisted of magnesium, calcium, B vitamins, and vitamin C. This treatment was made famous by Dr. Linus Pauling and many doctors around the world practice Orthomolecular Medicine with good clinical results. Dr. Pauling was well ahead of his time but today we need safer methods that are more practical and universal and easily administered to children. Though intravenous treatments for late or even early stage cancers as well as other life threatening disorders might be seriously consider, with IV treatments we have to take into account the high expense and additional risk. Transdermal treatments are applicable and effective for almost all medical conditions and situations and can be as quick acting as and IV drip. Contraindications and warnings are listed in the notes section. Epson Salt baths have been famous for many years and they impart magnesium transdermally in the form of magnesium sulfate. The "recipe" traditionally consists of one cup of Epson salts in a tub of warm water, soaking for approximately 30 minutes per day. There are two possible explanations for the success of this particular treatment: 1. Heat and/or relaxation therapy. 2. Transdermal (through the skin) absorption of magnesium. The Epsom salts some people take as a magnesium supplement contains magnesium sulfate, which is rapidly excreted through the kidneys and therefore difficult to assimilate. Whole sea salt contains magnesium chloride and magnesium bromide, which are easily assimilated and metabolized in the human body. Magnesium chloride, which is the prevalent form of magnesium obtained from sea water, is a very unique and powerful form of magnesium that is almost immediately assimilated by the body, through the skin, directly to the cellular level. By using what is called Magnesium Oil, either topically or in a soak, massive amounts of magnesium can be absorbed by our bodies. Body pains can be eliminated quickly in a strong soak. Magnesium Oil is made up of 35% magnesium chloride. Even though magnesium chloride is the most efficacious form of magnesium, when delivered orally it is minimally effective in delivering the magnesium to the cellular level where it can be used by the body to address the many areas of magnesium deficiency. Magnesium Oil delivers high levels of magnesium directly through the skin to the cellular level, bypassing common intestinal and kidney symptoms associated with oral use. Magnesium chloride has a major advantage over magnesium sulfate because it is hygroscopic and will attract water to it, thus keeping it wet on the skin and vastly more likely to be absorbed, while magnesium sulfate simply dries and becomes powdery. Magnesium Oil feels oily on the skin. The biggest benefit of topical magnesium chloride administration is that the intestines are not adversely impacted by large doses of oral magnesium. Topical magnesium chloride works fast to stop asthma attacks. Therapy is a severe renal insufficiency. Fick’s Law of Membrane Permeability says that the amount of any solute (magnesium) that will be absorbed is directly dependent upon the area of contact, the concentration of the solution and the time that the solute is in contact with the membrane Daniel Reid obviously realizes this basic principle and indicates that, “Using Magnesium Oil is the quickest and most convenient way to transmit magnesium chloride into the cells and tissues through the skin. 2-3 sprays under each armpit function as a highly effective deodorant, while at the same time transporting magnesium swiftly through the thin skin into the glands, lymph channels, and bloodstream, for distribution throughout the body. Spray it onto the back of the hand or the top of the feet any time of day or night for continuous magnesium absorption. Soak the whole body or just the feet in this bath water for 20-30 minutes, at a temperature of about 108 degrees The most effective protocol for this therapy is to begin with a daily body or foot bath every day for the first 7 days, then continue with a maintenance program of 2-3 times a week for 6-8 weeks or longer. To the bath water one can add 1/4 cup of Bath Salts, 1 tablespoon or more of Magnesium Oil and even Magnesium Bath Flakes, which are also sold. As with any healing process sensitive care must be taken especially with children as to dose levels, water temperature and magnesium concentrations. Reactions are rare but overdoing it is not a good idea. In his book "Holy Water, Sacred Oil", Dr. C. Norman Shealy has documented almost ninety health issues that are directly related to magnesium deficiency. Additionally, Dr. Shealy draws a strong correlation between magnesium levels and DHEA levels. He has also determined that when the body is presented with adequate levels of magnesium at the cellular level, the body will begin to naturally produce DHEA and also DHEA-S. The role of magnesium plays in the transmission of hormones (such as insulin, thyroid, estrogen, testosterone, DHEA, etc. ), neurotransmitters (such as dopamine, catecholamines, serotonin, GABA, etc. ), and minerals and mineral electrolytes is a strong one. This research concludes that it is magnesium status that controls cell membrane potential and through this means controls uptake and release of many hormones, nutrients and neurotransmitters. Since DHEA is one of the primary bio-markers for aging, the long range effect of large doses of magnesium in a usable form is to significantly raise DHEA levels and thus produce true Age Reversal results. Dr. Shealy refers to DHEA as the Master Hormone and when produced at sufficient levels, will induce the production of all of the other hormones whose depletion can be associated with many symptoms of aging. Indeed, through the use of Magnesium Oil, women have reported complete abatement of menopausal symptoms and some have even returned to their menstrual cycle. � Magnesium Oil sprayed on sun damaged skin regularly will begin to rejuvenate from the inside out and after a few months will be significantly restored. � Magnesium Oil sprayed and massaged into graying hair each evening and left on overnight, will begin to restore natural hair color within weeks and stimulate the growth of hair and greatly improve hair texture. � Magnesium Oil massaged onto balding areas of the scalp will begin to induce the growth of new hair. � Magnesium Oil sprayed into the mouth several times daily will stimulate the medulla oblongata and develop enamel on the teeth. � Magnesium Oil mixed into a hot bath with some Prill water, will provide a very relaxing soak while delivering a huge amount of magnesium to the cells. � Magnesium Oil rubbed regularly onto age spots will often cause them to fade and virtually disappear. � Magnesium Oil mixed with a little frankincense and myrrh and regularly rubbed into scar tissue will cause that tissue to reform into normal tissue. � Magnesium Oil rubbed onto skin tags will cause them to eventually drop off. � Magnesium Oil used in a bath or sprayed on after a shower, will relieve stress. Magnesium Oil may be used in a foot bath or even a hand bath if circumstances or condition do not permit soaking in a tub and the full benefits of a soak can still be experienced. In only 15 to 20 minutes, our magnesium deficient bodies will extract all of the available magnesium.